Beautiful! A lovely tale by Jean Giono. Last week a great friend of mine emailed me this delightful short-story and I felt I could not help writing about it. I hope he will like this post, it is specially dedicated to him. The story is a remarkable parable for all times and ages, it can be enjoyed by children as well as adults. It is an inspiring testament to the power of one person and gives a positive message about what can be done to restore the earth. This powerful eco-fable is the story of a tireless shepherd, Elzéard Bouffier, who planted a hundred acorns a day over thirty years and how this simply act heals a wounded earth and the wounds on mankind too. He not only transforms the desolate, barren landscape with miserable, contentious inhabitants to one filled with the scent of flowers, the songs of birds and fresh, flowing water. He also revitalizes his community, teaching us about hope, humanity and our own ability to create change in the world. The Man Who Planted Trees, Jean Giono's beloved tale was first published in 1954 by Vogue magazine, it has been translated into at least a dozen languages and has inspired many thousands of people qround the world regarding the benefits of planting trees. A Unites States publisher originally asked him to write a few pages about an actual memorable person, instead he wrote about a fictional character and they rejected this wonderful story because it was invented. Giono then donated his pages and made them available for free to readers anywhere. He later wrote to the American scholar and translator Norman Goodrich "It is one of my stories of which I am proudest. It does not bring me one simply penny and that is why it has accomplished what it was written for" and he said that his purpose in creating Bouffier was to persuade people love trees, or more precisely to make them love planting trees. Jean Giono (1895-1970) was a self-taught man, he lived his entire life in the little city of Manosque in France. His elderly father was a cobbler and his mother ran a hand laundry. This family of three lived in the poorest of tenements and at the age of sixteen he went to clerk in a bank. In 1929 he published his first two novels, "Hill of Destiny" and "Lovers Are Never Losers". They were followed by "Harvest" (1930), "Blue Boy" (1932), "Song of the World" (1934), "Joy of Man's Desiring" (1935), "Horseman on the Roof" (1951), and "The Straw Man" (1958). Giono wrote over thirty novels, numerous essays, scores of stories, many of which were published as collections, plays and film scripts. In 1953 he was awarded the Prix Monégasque for his collective work and in 1954 he was elected to the Académie Gouncourt, whose ten members award the annual Prix Goncourt. Jean Giono died, midway through his seventy-fifth year. The adventure started in 1913, during a walking tour through the old Roman province of Provence in France. The narrator (Giono, himself?) hiked along the wild, deserted plateau. This region near the Alps is marked by high winds and the lack of water has turned the area bare and desolate. He met a shepherd, Elzéard Bouffier, and stays overnight with him. The man lived in a stone house, not a hut and is clean, groomed, the house tidy, the food good. Even his dog "as silent as himself" was "friendly without being servile". He was left alone by the death of his wife and son and had little and wanted for nothing, but the landscape where his sheep grazed was desolate and the closest villages were days away by foot, and most ot these were small, miserable collections of abandoned ruins. The next day he notices that the watersoaked acorns the shepherd had so carefully culled the previous evening are the seeds for oak trees. Invited by the shepherd he accompanies him on his rounds for the day, which consist of punching a hole in the ground at regular intervals with his iron rod, placing one acorn in the hole, and covering it with dirt. The man (in his 50's in 1910 at the start of the story) explains that he has planted 100,000 acorns in three years, of which 20,000 sprouted. Of those he calculated 10,000 would survive. He did not own the land he was reforesting; what he possessed was hope. The narrator returns after the World War I and finds a great younf forest covering the previously barren hills and the shepherd, untouched by war, still planting trees. He had become a beekeeper who already ressemble God more narrowly by his power to create a new earth. He was planting oaks, beeches and birches. Life returned (water, flora and fauna). Miraculously, water was conserved, dry streams filled again, and seeds germinated into gardens, meadows, and flowers. Bouffier carried on equally unaffected by World War II, and as his forest of millions of trees spread and overtook abandoned villages, the communities, too, returned to life. People repaired the broken houses and began to bringing up their children there, women planted vegetables and flowers gardens in their backyards and men once again took pluoghs into the fields. Finally, the Frenc government gives official protection to this astonishing resource without ever knowing that what it called a "natural" forest was, in fact, the product of one man's lifelong devotion, and more than 10,000 people lived there unaware that their happiness was due to Elzéard Bouffier. In 1945, the narrator visits again the now very old Elzéard Bouffier. His village and the countryside around it thrive, and this is reward enough for this humble man. The narrator also notices that the people in the village has become more kindly and optimistic once the trees have grown. In 1947 the man who planted trees died peacefully in the hospice of Banon. It has been made an animated film adaption of this wonderful story. It is a masterpiece of animated art. This 30 minute short eco-film was produced by Fréderic Back in 1987. It won the Academy Award for best animated short film. And now it comes my reflection of what I can do after reading this magnificent story, both as a person and as a teacher. As a person I have become aware of the importance of working generously to change the world, and how human communities can be restored along with nature. Human beings cannot make progress in a place where the natural environment has been degraded. So the effects of tree planting can be a good idea for reversing the present environmental decline in cities and rural areas across the globe. And because tree planting is potentially so powerful, it is important to take an effective action, whether I get involved by supporting others or make my own commitment taking care and protecting trees as well as informing and motivating people to do it. Also, I can collaborate with international nongovernmental organizations (NGOs) and local organizations devoted to this cause. As a teacher I have thought about celebrating the Tree Day, April 29 in any way. 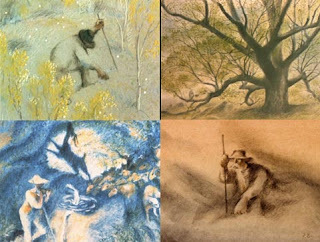 This story can be used to teach about trees and the environment, history, geography, English, French and language arts. Maybe the English Department collaborating with other Educational Departments such as The French and Biology ones could plant a tree in the school garden and also we can watch the eco-film The Man Who Planted Trees with some follow-up activities. This unforgettable and charming story will show new generations of readers the power of trees to change lives and Earth herself. It is also a vision of the good things that happen whrn we care for the world around us, and take what was barren and make it green. I hope Giono's tale inspires us to plant trees wherever we can. It is written plainly and gently, it is a tale everybody should read and it is a wonderful book for those difficult days when you feel you are running uphill and everything seems imposible. "Jean Giono's story of a man's generosity to nature -and throuh nature, to other humans- surely belongs among the most moving and endearing statements of our hope. The stoy-vision and parable and manual- correctly opposes the tree-planter, the earth-husband, to the makers of war. In the figure of Elzéard Bouffier, Giono summarizes the best that can be said of our species. It has given me much joy to reread this story".